The hubby and I had a house guest recently who shared that one of his favorite treats is red velvet cupcakes. The hubby and I also like red velvet cupcakes, yet, surprisingly, I had never made any before. Late one night, after an awesome evening of bowling (I bowled a flawless 183 game, every frame a spare or strike--not bad for my 4th time bowling) I returned home with the hubby and a couple of his friends and decided to make these cupcakes. Before I started these, I had been planning on doing some regular and some mini cupcakes, some with white frosting and some with light pink to compliment the deep red color of the cupcakes. However, once I got started on the batter, after adding squirt after squirt of red food coloring and not achieving that traditional red batter I had a gorgeous deep pink instead. I was in love! 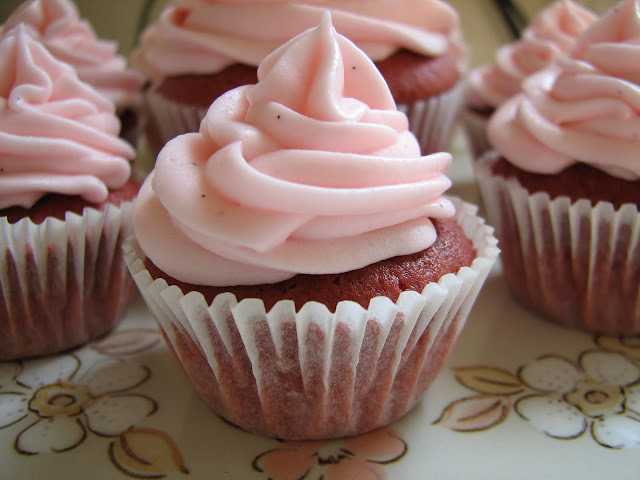 Once I saw the bowl of beautiful pink batter, I had no desire to make traditional red "Red" Velvet Cupcakes. Instead I had Pink Velvet Cupcakes and I couldn't be happier. 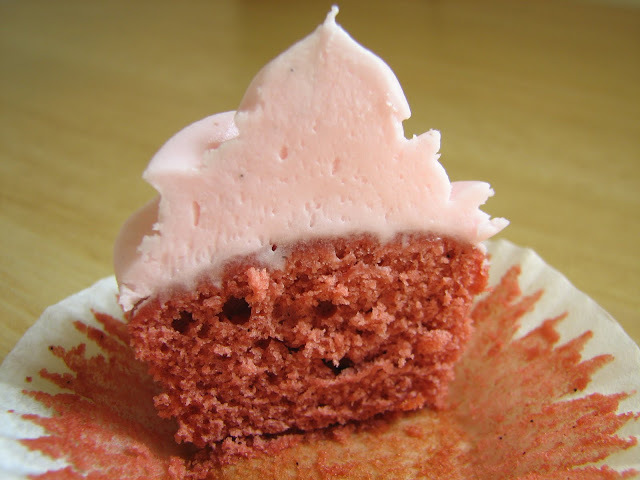 With the deep pink cupcakes out of the oven, I knew I had to make pale pink frosting to match. I used vanilla bean paste instead of vanilla extract in the Cream Cheese Frosting so I'd have those sweet little vanilla bean specks that I love so dear. Aren't the colors just lovely together? 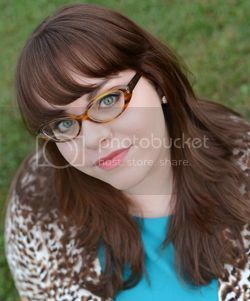 I was head over heels for how cute these turned out. 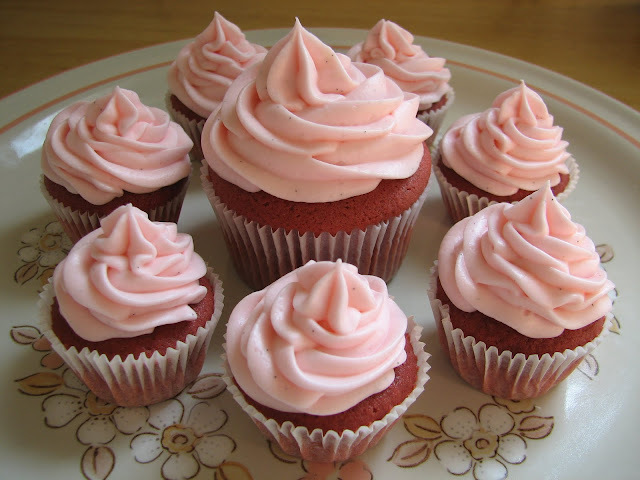 I rushed while frosting the cupcakes as I was making them for a room of men who where eagerly awaiting them. I usually try to be a bit more precise with my piping, but I think these are pretty cute even if rushed. They certainly were delicious! The Cream Cheese Frosting was light and airy with the perfect balance of sweetness and tang. 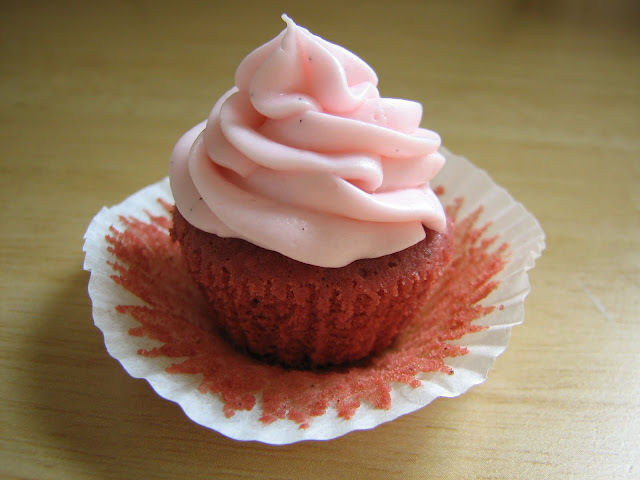 The Pink Velvet Cupcakes had such a delicious, tender crumb. I will definitely be making these again! Preheat oven 350F. Prepare cupcake pan with liners. Sift together cake flour, cocoa powder, baking powder and salt into a bowl. In a large Pyrex measuring cup, whisk together the buttermilk, vanilla, vinegar and red food coloring; set aside. In a stand mixer with flat beater, beat the sugar and butter on medium speed until light and fluffy, 2-3 minutes. Add the egg. Mix to combine. Add the flour mixture in 3 additions alternating with buttermilk mixture in 2 additions, ending with the flour mixture. For mini cupcakes: Fill each liner with 1 tablespoon of batter. Bake for ~13 minutes. 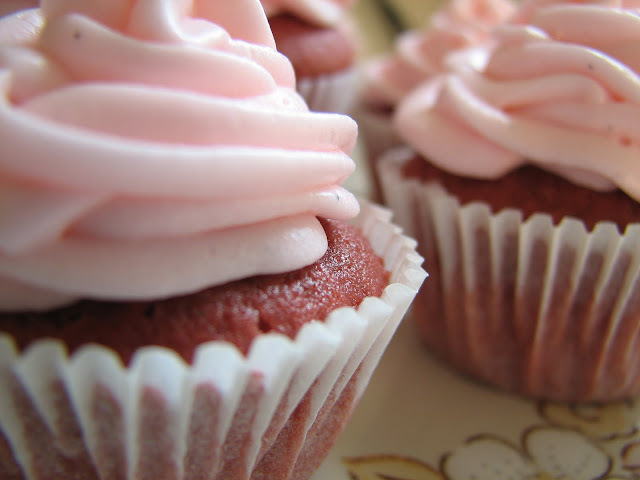 For regular cupcakes: Fill each liner with 4 tablespoons (1/4 cup) of batter. Bake for ~18 minutes. With a stand mixer on low speed, beat the cream cheese and butter until well blended. Mix in vanilla. Slowly add the powdered sugar, 1/2 cup at a time. Once all the powdered sugar has been added, add a very small drop of pink gel food coloring. Increase to a higher speed and whip the frosting until it is light and fluffy. 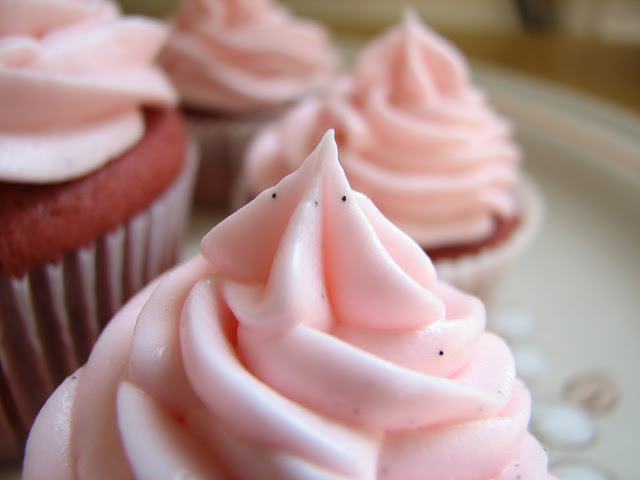 Spread frosting on cooled cupcakes or use a piping bag and tips to achieve an attractive swirl. *I made 6 regular cupcakes and 24 minis. 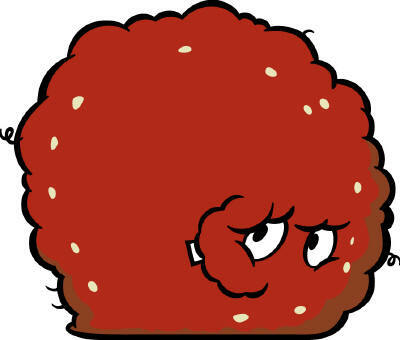 When I cut into one of the mini cupcakes a little Meatwad face appeared... but then I ate him.